I have had the fortunate opportunity to try some of today’s best commercial farmhouse ales; Sante Adarius Saison Bernice (#6 on Beer Advocate Top Rated Beers: Saison / Farmhouse Ale) , Hill Farmstead Arthur (#10), Fantôme Saison (#11), Side Project Saison du Blé (#12), and Logsdon Seizoen Bretta (#16), just to name a few. While each was uniquely phenomenal, none of the top-rated farmhouse ales fully aligned with my vision of farmhouse ale. That is, until I tasted Jolly Pumpkin Bam Bière. My recipe is not a clone, but rather a tribute to Bam Bière. After a few recipe iterations under my belt using my house yeast, I knew that the grain bill would have to be augmented to achieve similar flavors to Bam Bière; I selected pilsner, 2-row, rye, wheat, and flaked barley. The rye was included to make up for the lack of spice character from my house yeast. Crystal malt and black malt were replaced by an extended boil, intended to darken the wort and add Maillard compounds. And in place of Crystal hops, I used Willamette, since those are available locally. The brewing and fermenting processes were very similar to Jolly Pumpkin’s with two exceptions – I pitched my house yeast and plan to blend in acid beer and funky beer to achieve the final flavor characteristics. I even performed open fermentation (kind of)! Description: A tribute (but not clone) to Jolly Pumpkin’s Bam Bière; a golden, naturally cloudy, bottle conditioned artisan farmhouse ale that is dry hopped for a perfectly refreshing balance of spicy malts, hops, and yeast. Notes: Brewed solo on 5/1/2016. pH readings were 5.39/5.52/5.75/5.57/5.45 (mash/2nd run/3rd run/preboil/postboil). Mashed using a 1.75 water to grain ratio, which resulted in a better than average efficacy (93% instead of 85%). This meant a higher SG than anticipated, but that’s alright. Boiled for 2 hours. Ran off 5 gallons to a fermentor for a clean lager ferment. The remainder was hit with another dose of hops during the whirlpool. 1.5 gallons was run off for a mini-fermentation with 12 new foraged yeast candidates. The remainder was run off into a 7 gallon plastic bucket. House yeast was pitched after aeration. Lid was placed atop bucket but left loose, and airlock opening was covered with foil to simulate open fermentation. Fermentation temperature started at 68°F, but left to free-rise at ambient temperature. 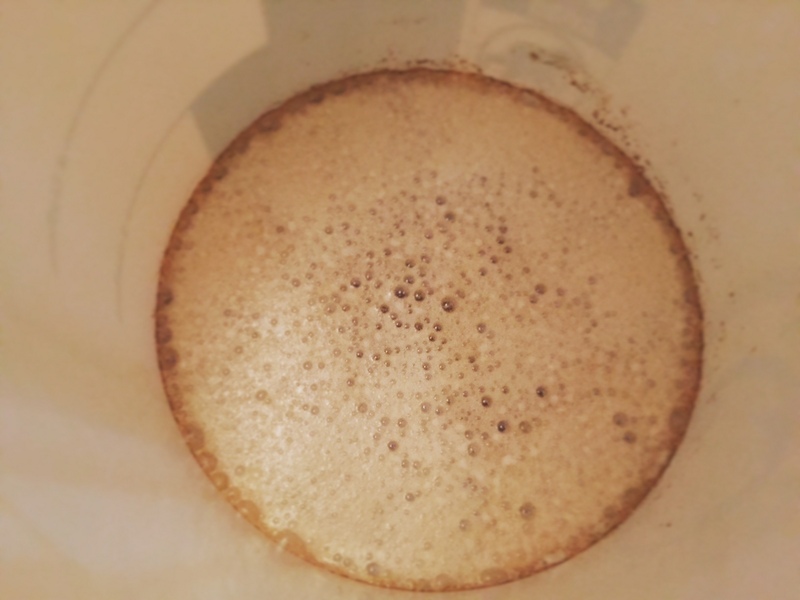 6/2016 – Transferred Farm Bière to corny keg to free up fermentation space. 4/2017 – Bottled Farm Bière using priming sugar. Targeted 3.0 volumes. 5/22/2017 – Tasting notes from the first bottle!